On September 19, 2017, 6mR World Championship guests will experience an evening of First Nations culture at UBC’s Museum of Anthropology (MoA), supported by our Presenting Partner, PARC Retirement Living. The museum is located on the traditional and unceded territories of the xʷməθkʷəy̓əm (Musqueam) First Nation at the University of British Columbia campus, and is known for its displays of First Nations cultural heritage. World renowned clay artist and elder Laura Wee Lay Laq (Wealick) will be MC’ing the First Nations component of the event. You met her at our Opening Ceremony. As a special goodie for you, Laura made a drum with water waves on the outer ring and paddles pointing inward to each other that we will raffle off. Ticket prices are: $5.00 for 3, $10.00 for 7 and $20.00 for 18. Cash only. Laura is a contributing artist to the MoA. See if you can find her piece of pottery in the Crowner’s Gallery. We have partnered with the Pacific Institute of Culinary Arts (PICA) to present an entirely First Nations themed menu. The food for the event will be presented in three courses, organized into themes of “Air”, “Sea”, and “Land” – yum! The MoA event will include a performance by the Squamish nation dance group “Spakwus Slulmum” (translated to ‘Eagle Song Dancers’), who will perform their own singing and drumming. We are lucky to have the MoA entirely to ourselves for this evening of food & culture – but don’t worry, the gift shop will be open! 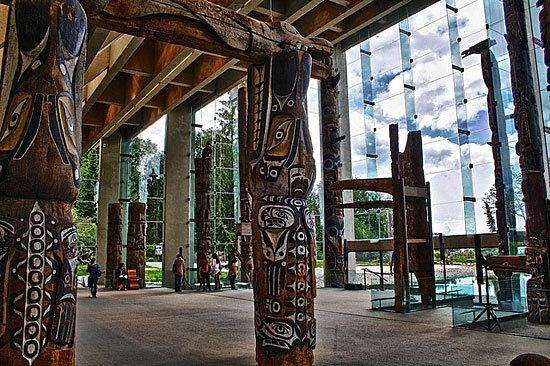 The Museum of Anthropology (MoA) is located on the traditional and unceded territories of the xʷməθkʷəy̓əm (Musqueam) First Nation at the University of British Columbia campus, and is known for its displays of First Nations cultural heritage. Founded in 1947 using UBC’s collection of ethnographic objects, the museum started in the basement of the UBC Library. When additional funds became available from the Government of Canada in 1971, a new building was designed by renowned architect Arthur Erickson (who also designed the Simon Fraser University campus in Burnaby) using the “post-and-beam” style characteristic of Northwest Coast First Nations. While the MoA features an ongoing cycle of exhibits, there are several key pieces that remain part of the museum’s permanent collection. For instance, the museum’s Great Hall showcases a collection of totem poles from First Nations villages along British Columbia’s northwest coast. Other major exhibits include a collection of Musqueam artifacts and contemporary works by celebrated Musqueam artists including Susan Point and Debra Sparrow. The MoA also has an impressive collection of works by Haida artist Bill Reid, including his yellow cedar sculpture The Raven and the First Men, the Bear and Wasco sculpture series, and a prototype dugout canoe that Reid carved for Expo ’86. 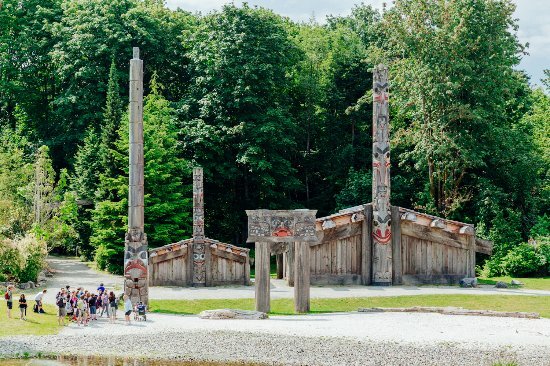 Outside the museum, there are two Haida houses that were built under the direction of Reid; these houses are surrounded by totem poles that were carved with the help of Kwakwaka’wakw artist Doug Cranmer. In 2000, the original totem pole mounted outside the big house was taken inside due to deterioration, and replaced with a new pole carved by Haida artist Jim Hart. At any given time, the museum holds around 40,000 ethnographic objects, and 535,000 archaeological objects. In addition to Northwest Coast First Nations objects, the MoA also boasts an extensive collection of items from the South Pacific, including materials from late nineteenth-century Africa, Asia, and South America. Currently, the MoA is featuring two new exhibits. The first, “Amazonia: The Rights of Nature” (March 2017-January 2018), explores creative approaches to Indigenous resistance in the face of threats to the Amazon rainforest. This exhibit features a collection of Amazonian textiles, basketry, feather works, and ceramics that reflect both every day and ceremonial usages by Amazonian peoples. The second exhibit, “Traces of Words: Art and Calligraphy from Asia” (May-October 2017), explores the relationship between words and their physical manifestations across various time periods. The MoA will also open a new Gallery of Northwest Coast Masterworks this summer, combining technology with First Nations artwork for the inaugural exhibit “In a Different Light: Reflecting on Northwest Coast Art”. This exhibit runs until Spring 2019, so there is lots of time to check it out! With the Team Dinner at the MOA quickly approaching, it’s a good idea to become familiar with local Indigenous nations and protocols. In Vancouver, we are privileged to live, work, and play on the unceded and traditional territories of the xʷməθkʷəy̓əm (Musqueam), Səl̓ílwətaʔ/Selilwitulh (Tsleil-Waututh), and Skwxwú7mesh Úxwumixw (Squamish) peoples. It is proper protocol to acknowledge these three host nations individually, or the Coast Salish People in general, during ceremonies or events that take place on unceded lands. We are also pleased to announce that Squamish artist Xwalacktun (Rick Harry) and his son, James Harry, as well as Tawx’sin Yexwulla or “Splash” (Aaron Nelson-Moody) from the Squamish nation will assist in the welcoming/closing ceremonies of the 6mR events.